The Grand Palace. All photographs by Dan Fellner. There are few cities in the world that are as exhilarating and exhausting as Bangkok. Asia’s most popular tourist destination, with more than 12 million international visitors in 2012, can be daunting at first with its stifling year-round heat and humidity, incessant street noise, wild and rowdy nightlife, and traffic jams that stretch for miles. But these become simply minor annoyances when put into the greater context of the wonders offered by this chaotic city on the Chao Phraya River. Bangkok’s splendor and history are most apparent in the central Grand Palace, a dazzling monument to the country’s royal family and Buddhist traditions. There are resplendent temples and stunning, gold-plated statues visible with every turn of the head. In this city of around nine million residents, the contributions of Bangkok’s relatively small permanent Jewish community far outweigh its size. And the community has become more than adept at meeting the spiritual needs of Bangkok’s huge influx of Jewish visitors. A few blocks away from the Grand Palace, in a section of town popular with backpackers, there are so many Israeli tourists that it is not uncommon to see shop signs in Hebrew. From the early 1600s, when they first settled in the Siamese kingdom of Ayutthaya, Jews have found a safe haven in this religiously tolerant land that is now 95-percent Buddhist. In 1601, Spanish missionaries reported seeing Jewish merchants in Ayutthaya who maintained a synagogue. Jews didn’t settle in Bangkok until the late 19th century, when a few East European families immigrated to the city. One of those families—the Rosenbergs—established some of the first modern hotels in Bangkok. Following World War I, the community grew with an influx of Russian Jews fleeing discrimination from the Soviets. In the 1930s, about 120 Jewish refugees arrived from Germany. With the help of local Jewish residents, they were admitted to Siam in spite of protests by the German government. The country, which changed its name to Thailand in 1939, was invaded by the Japanese in 1941 and quickly surrendered. During World War II, some Jews in Bangkok were interned by the Japanese as enemy aliens. Around 150 Jewish Allied soldiers were imprisoned in the notorious Japanese POW camp in Kanchanaburi, about 80 miles northwest of Bangkok. The camp supplied the labor to build a railway line to Burma and the bridge on the River Kwai, later immortalized in the iconic movie. A rabbi was among the POWs and conducted makeshift services at the camp. The decades following the war brought slow but steady growth to Bangkok’s Jewish population, with Jews arriving from the United States, Israel, Iraq, Iran, Afghanistan and other countries. The Vietnam War brought hundreds of American Jewish servicemen to the city, and the first resident rabbis—American military chaplains—were brought in to meet their needs. In the 1970s, Bangkok began attracting significant numbers of vacationing Israeli backpackers. Several Israelis relocated to the city, a number of them working in the jewelry and gemstone business. In 1993, Rabbi Yosef Kantor took up residence as the first permanent rabbi in Bangkok. Twenty years later, as the chief rabbi of the city, he continues to preside over Temple Beth Elisheva, which is Thailand’s only freestanding synagogue. 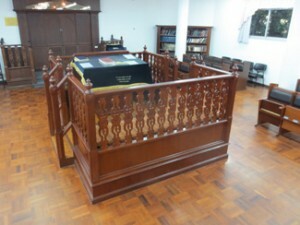 There are three Jewish houses of worship in Bangkok, all under the auspices of the Chabad-Lubavitch-affiliated Jewish Association of Thailand (011-66-2-663-0244; www.jewishthailand.com). The JAT, with almost 200 members, is administered by Kantor and a board of directors. Temple Beth Elisheva (121 Soi Sai Nam Thip 2, Sukhumvit Soi 22; 66-2-663-0244) is named after Elizabeth Rosenberg Zerner, the Thai-born daughter of one of the first Jewish families in the country, who donated land for the building in the mid-1960s. Portraits of Zerner and her husband, Winhalm Zerner, hang outside the sanctuary. The three-story synagogue is located on a quiet side street off busy Sukhumvit Road, Bangkok’s business and commercial hub. It is enclosed by a courtyard and surrounded by high-rise hotels and apartment buildings. The second-floor sanctuary features a beautiful wood bima; the rabbi and his family live on the third floor. A small structure in the courtyard houses Bangkok’s only mikve. More Sefardic in prayer style, the Even Chen Synagogue (Soi Charoenkrung 42/1 New Road) is located on the fourth floor of an office tower attached to the Shangri-La Hotel. The complex overlooks the Chao Phraya River in the heart of Bangkok’s jewelry district. Many of Even Chen’s members are Israeli gemstone dealers. Chabad House in the backpacker district. By far, Bangkok’s busiest Jewish house of worship is Ohr Menachem Chabad House (96 Ram Buttri Road, Banglampoo; 66-2-629-2770; bkk@chabadthailand.com). The five-story building is located near Khao San Road, the center of Bangkok’s backpacker district. The area is known for its budget accommodations, low-priced restaurants and tour companies. Rabbi Nechemya Wilhelm has presided over Bangkok’s Chabad House since 1995. He says that Friday night Shabbat services and meals typically attract between 200 to 400 visitors, and at least 95 percent are tourists from Israel. Rosh Hashana holiday services have drawn as many as 1,500 worshipers. The city’s only kosher restaurant, The Kosher Place (66-2-629-2754-5), is located on the first floor of the building. It serves several hundred meals a day and also offers delivery service. Wilhelm estimates that close to 150,000 Israelis—many just having completed military duty—visit Thailand each year. They are drawn to the country by its warm weather, relatively affordable prices, historic sites, jungle trekking, nightlife and beaches. A lot of them arrive on daily nonstop flights from Tel Aviv and use Bangkok as a starting point from which to explore other parts of Thailand and Southeast Asia. Thailand’s popularity with Israeli tourists has made Bangkok’s Chabad House one of the most popular Lubavitch centers in the world. “I don’t think there are many Chabad Houses anywhere that have 400 to 500 people passing through each day,” Wilhelm says. Estimates of the number of year-round Jewish residents in Bangkok vary from 700 to 1,000. But Wilhelm thinks it may be even higher. “Every day we meet Jews who live here that we didn’t know about,” he says. Wilhelm notes that the Thai people and government have been more than welcoming to Jews, whether visitors or full-time residents. He cites a recent example in which the Jewish community requested permission from the Bangkok police to build a large sukka on the street. A silkweaving demonstration at the Jim Thompson House and Museum. In 1997, the Jewish community bought a parcel of land and consecrated a small cemetery adjacent to a Protestant cemetery. About 20 Jews are now buried there. About a 15-minute walk southwest of Chabad House, Bangkok’s must-see attraction is the spectacular Grand Palace. The complex was established in 1782 and houses the former royal residence and the most revered religious site in Thailand—Wat Phra Kaew—the Temple of the Emerald Buddha. It is well worth putting up with the thousands of tourists who visit the Grand Palace each day to explore its many monuments and admire its color and intricate statues. The Emerald Buddha statue is actually made from a block of green jade and was first discovered in 1434. Enshrined on a golden throne, the Buddha is clad in seasonal costumes, which are changed three times a year in a ceremony presided over by the king of Thailand. 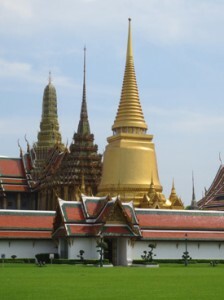 There are strict dress codes at the Grand Palace; visitors are not allowed inside the grounds with exposed shoulders or shorts or skirts above the knee. As is Buddhist custom, visitors are required to remove their shoes before entering places of worship. Bangkok’s much-hyped floating markets, in which peddlers on small riverboats sell everything from trinkets to made-to-order grilled and stir-fried foods cooked right on the boats, have become overly touristy. A more authentic way to explore the city is to take a cruise on the Chao Phraya River and its many offshoot khlongs (canals) that offer glimpses into Bangkok’s history. A major conduit for trade, the river used to be the focal point of city life. There are many types of trips and boats from which to choose, including the ubiquitous long-tail boats and rice barges. There may be more popular museums in Bangkok, but few are as interesting and well laid-out as the Jim Thompson House and Museum (6 Soi Kasemsan 2; 02-216-7368; www.jimthompsonhouse.com). Thompson was an architect and American military officer who moved to Thailand after World War II. He devoted himself to reviving the craft of hand-weaving silk, a long-neglected Thai cottage industry. Thompson’s silks were used in the 1956 movie The King & I. Entrance to the museum includes a guided tour of Thompson’s home, which is actually a cluster of six different historic Thai homes from central Thailand that were dismantled and rebuilt in Bangkok. The beautifully decorated house contains a splendid collection of sculpture, carvings and paintings from the region. In 1967, Thompson disappeared while on a trip to Malaysia and his body was never found. However, his residence remains as a tribute to his deep love of Thailand. The museum is conveniently located near the National Stadium, a short walk from the BTS Skytrain, Bangkok’s elevated train system. Remains of the ancient Buddhist temple in Ayutthaya, former capital of Thailand. The magnificent ancient city of Ayutthaya, a Unesco World Heritage Site, is about a one-hour drive north of Bangkok. Thailand’s most-visited historical site evokes comparisons to the more widely known Angkor Wat in neighboring Cambodia. Although much smaller in scope than its Cambodian counterpart, the archaeological ruins in Ayutthaya are remarkable. Ayutthaya was the former capital of the Kingdom of Siam, which existed from 1350 until 1767, when it was destroyed by the Burmese army. At its height in 1700, Ayutthaya had a population of close to one million, making it one of the world’s largest and most prosperous cities. 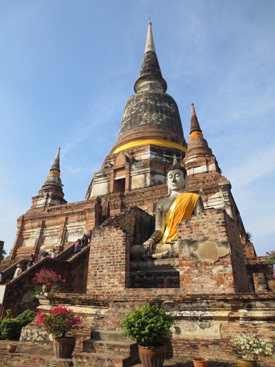 Day tours from Bangkok enable visitors to marvel at Ayutthaya’s expansive collection of palaces, temples and Buddhas. The old part of the city is actually an island at the confluence of three rivers. Architecture in the surrounding area offers an interesting mix of styles, with tall spires (prangs) from ancient Khmer (Cambodia), to pointed stupas from the Sukhothai Kingdom in northern Thailand. Some of Ayutthaya’s ruins remain in disrepair and restoration efforts suffered a setback in 2011 when there was heavy flooding. Farther north, the popular tourist destination of Chiang Mai is a gateway for jungle trekking, whitewater rafting and an opportunity to explore elephant parks and small villages inhabited by hill tribes. Chiang Mai is easily accessible from Bangkok by bus, train or plane; there are low-priced 70-minute flights that leave Bangkok virtually every hour of the day. Chiang Mai is a bit cooler than Bangkok, less polluted and more relaxed. The city’s name, pronounced chang my, means “new city” in Thai because it became the capital of the Kingdom of Lanna in 1296, the year Chiang Mai was founded. The city still is surrounded by vestiges of a wall and moat that were originally constructed for its defense. About 250,000 people now live here. About 30 percent of the Israelis who visit Bangkok end up going to Chiang Mai during their stay. 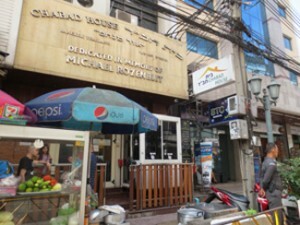 There is a Chabad House in the downtown area (189/15 Chang Klan Road; 66-53-279-015; cm@chabadthailand.com), located a block from the Shangri-La Hotel. Rabbi Yosef Pikel, who moved to Chiang Mai four years ago from Israel and lives there with his wife and three children, said about 10,000 people visit the Chabad outpost each year. Rosh Hashana services in 2012 had so many worshipers—550—Chabad had to rent a ballroom in a local hotel to accommodate the crowd. There is an onsite kosher restaurant and several Israeli-owned cafés and travel agencies in the neighborhood. A few hundred Jewish ex-pats, many of them American, also live in Chiang Mai. Some get together informally for Jewish holidays. Fleeing persecution from the Communists in the Soviet Union, Henry Gerson immigrated to Siam in 1920. An architect by training, he was commissioned by the king to do some interior work at the Royal Palace. Gerson went on to form a successful furniture and construction company in the Bangkok area that employed thousands of people, and he became an important leader in the Jewish community. Ronald Cristal, an American lawyer, arrived in Bangkok during the Vietnam War as a United States judge advocate. He remained in Thailand after the war and developed a successful business law practice, ultimately becoming a Thai citizen in the 1980s. Cristal has a passion for numismatics and coauthored the first book in English about Thailand’s currency, Siamese Coins: From Funan to the Fifth Reign (River Books). David Lyman is the chairman of the largest independent law firm in the country and the former president of the American Chamber of Commerce in Thailand. Lyman, who has served on several committees to advance environmental protection in Thailand, owns two elephants. Jews in Thailand (River Books) is the only book that focuses specifically on Jewish life in Thailand, from its history to the present-day community. It was coauthored by Ruth Gerson, Henry Gerson’s daughter-in-law, and Stephen Mallinger. Bangkok Inside Out (Equinox Publishing) gives travelers a useful and entertaining heads-up on what to expect in Bangkok on everything from motorcycle taxis to stray dogs. There are few cities in the world that can match Bangkok’s sheer volume and quality of street food, with vendors on seemingly every block cooking up fresh fare for locals and tourists alike. Written by Australian chef and restaurateur David Thompson, Thai Street Food (Ten Speed Press) is a definitive guide to Bangkok’s culinary street culture. The Rembrandt Hotel Bangkok (19 Sukhumvit Soi 18; 66-0-2261-7100; www.rembrandtbkk.com) offers reasonably priced, good-quality accommodations in Bangkok’s main commercial and shopping district. On the hotel’s 26th floor is one of the city’s finest Indian restaurants, the Rang Mahal. It features numerous vegetarian options as well as wonderful views of Bangkok’s skyline. The Rembrandt is a 15-minute walk from Temple Beth Elisheva. Bangkok is not an easy city to traverse. A modern train and subway system, while clean and safe, covers only part of the city and traffic remains horrendous. Walking the streets can also be challenging as sidewalks—if they exist at all—are often blocked by food vendors or used as parking lots by motorbikes. But when inevitable frustrations occur, it is best to do as the locals do and practice the Thai philosophy of jai yen, stay calm and cool-headed. Do so, and Bangkok will more than make things right. Dan Fellner is a faculty associate at Arizona State University. His website is www.Global-Travel-Info.com.